Hi - I am Mrs Jane Rajamalar from South India. From childhood I was so interested in drawing & paintings. My father draws nicely...he taught me some small simple drawings in our floor with chalk pieces. In my classroom when my teacher wass teaching my eyes were there but my hands were scribbling some drawings in rough note. If you see in all my notes and books, the last page won't have space....filled with drawings. I love drawings that much. If I see tv I will be seeing the colour combinations always and admire and try to use them in my drawings. I asked my parents to send me to drawing school...but because of poverty they couldn't. Then in my college days in 2000 I got a chance to attend drawing class...an artist came on weekends...I used to expect her eagerly...if anyday she was absent then I went home with a sad face. My parents bought me poster colours & quality brush for me...i was soo happy, and I started drawing in my sketch book. I learned glass painting, mat painting, bottle painting and fabric painting. I was so proud to attend those classes. My friends know I draw nicely so they give their records & observation notes to me to draw...I happily do that for them, and sit full nights to finish mine & others' drawings. Then after my marriage my husband gifted me acrylic colours and artist pad. I was excited. I painted daily. Then I started teaching drawing classes at home for school students...in North India (Chattisgarh). I learned hindi by teaching them drawing. Then again we were transferred to South (Bangalore). There too, I taught drawing for kids. We were transfered to Trichy before 1 year was up, and here too I am teaching drawing. Tomorrow I'm going to conduct a drawing competition. I'm thankful with tears for my father who inspired me in the path of drawing. 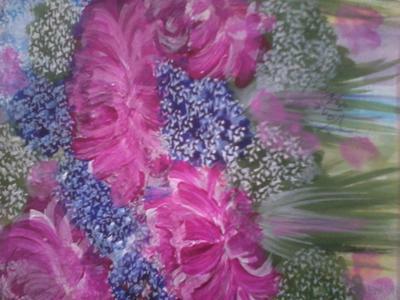 This painting I made was inspired by some colours I saw....I was in a happy mood seeing those colours...Thank you. Thank you so much for sharing your interesting and inspiring story. And thank you for passing your father's legacy on to other children. Someday, some of them will be "thankful with tears" for you! You inspire me to try teaching some children in my city, whose families cannot afford to send them to art school. Your picture is beautiful, Jane. How lucky you were to have a father who dedicated time and attention to you!